Park Forest, IL—(ENEWSPF)—The Park Forest Police Department invites you on Tuesday, August 2 between t p.m. and 10 p.m. to join them, along with 37 million other citizens across the country, in celebrating National Night Out Against Crime. You can organize a gathering on your block and join the community in standing up against crime. Additional information about the event can be found in the ‘This & That’ section. The Village of Park Forest Board is scheduled to hold a Saturday Morning Rules meeting on August 6 at 10 a.m. The Village Board meets at Village Hall, 350 Victory Drive. Residents are encouraged to attend. Board meetings air live on cable access channels (Channel 4 for Comcast subscribers and Channel 99 for AT&T subscribers). GSU’s Center for Performing Arts’ 2016-17 season lineup brings a mix of fresh, fun, and nostalgic programs, showcasing fan favorites like blues prodigy Jamiah Rogers, and Chicago Southland premieres by Porchlight Music Theatre, Chicago Dance Crash, and Chicago Jazz Philharmonic. Enjoy a new view of the arts as you sit on the stage with the artists in one of many “on stage experiences.” Where else can you sit on the stage at a theatre in Chicago? The Center is the first to offer this unique access for a variety of programs, including opera events paired with food and wine, theatre, musical Broadway, and blues. Laugh with the Steve Cochran Comedy Tour, starring WGN Radio’s popular morning show host and featuring comedians Rocky LaPorte (The Tonight Show), Pat McGann (David Letterman) and John DaCosse (WGN Morning Show). Celebrate the Cinderella story in Dallas Children’s Theatre’s Mufaro’s Beautiful Daughters: An African Tale. Or ring in the holiday season with a trip to Salt Creek Ballet’s The Nutcracker, featuring international guest artists, a sugar plum party, and pictures with Santa. Plan the perfect Valentine’s weekend date night with Artists Lounge Live’s Unforgettable: Falling in Love with Nat King Cole, starring Evan Tyrone Martin of Porchlight Music Theatre’s Dreamgirls fame. You’ve seen the movies, now be blown away by the sounds of an all-new touring production of Drumline Live! Be one of the first to experience one of the three Chicago Southland national tour premieres: street dance phenomenon, Evil and Good by Chicago Dance Crash, Porchlight Music Theatre’s The Scottsboro Boys and Orbert Davis’ Chicago Jazz Philharmonic’s The Monk Meets the First Lady, a celebration of jazz centennials Ella Fitzgerald and Thelonius Monk. Celebrate the late great Prince at the GSU Dance Company’s spring 2017 dance festival. Immerse yourself in Shakespeare’s The Tempest, performed as never before, outside in the renowned Nathan Manilow Sculpture Park. Join your Center in new ways to experience the arts—with food, fresh views, favorite titles, and of course the friendly customer service you have become accustomed to at GSU. The Center for Performing Arts welcomes you to campus, where parking is free and performances are always more than just a show. August 1—Tickets on Sale for Individual Show Buyers. For discounts and Box Office information visit www.govst.edu/BoxOffice. The Center for Performing Arts is honored to be supported by First Midwest Bank, The Chicago Community Trust (Made in Chicago series), Arts Midwest Touring Fund and the Illinois Arts Council, a state agency. For a complete list of the Season’s events, and information about purchasing tickets, visit: http://www.govst.edu/About/Center_for_Performing_Arts/All_Events_by_Date/. On Sunday, August 14, 2016, the Chicago Professionals for Parkinson’s Research will hold its first annual Tips for Parkinson’s event at the Thompson Chicago hotel. The event —first launched 11 years ago in New York City —combines food, silent auction, a 50/50 raffle and a bartending competition for an afternoon of fun, while raising awareness and money for the Michael J. Fox Foundation and its mission to find a cure for Parkinson’s disease. Bartending teams will compete against one another to raise money for Parkinson’s research. Each team, made up of 3-4 people, will have 45 minutes to serve drinks and collect tips. At the end of the day, the winning team will be awarded a prize and be named the 2016 Tips for Parkinson’s Champions. Interested in creating a team? Please contact Abby Baumann at [email protected] to set up a team. Teams must raise a minimum of $200 prior to the event to compete. Team members do not need to purchase event tickets. Not interested in bartending? Come out and support your favorite bartenders and get ready to tip for a cause on Sunday, August 14th from 1:30 PM to 5:00 PM. The event takes place at the Thompson Hotel located at 21 East Bellevue Place in Chicago’s Gold Coast neighborhood. Tickets include beer, wine and appetizers. Pre-sale tickets are available for $45 through July 11. Starting July 12th, tickets can be purchased online for $55 or can be bought at the door for $65. Come out and tip for a cause! Hope to see you there. For additional information about Chicago Professionals for Parkinson’s Research, visit: http://www.teamfoxchicago.com/. Chicago artist Barbara Rossi’s enigmatic drawings and meticulous Plexiglas paintings will be featured at the DePaul Art Museum through Aug. 21. ‘Barbara Rossi: Poor Traits’ is organized by Natalie Bell at the New Museum in New York and marks the most significant presentation of the artist’s work in 25 years. A companion exhibition, ‘Eye Owe You!’ will highlight Rossi’s photographs and artistic process. DePaul Art Museum has organized a companion exhibition, “Eye Owe You!” in close collaboration with Rossi as a way to illuminate her working process. The exhibition features 124 of Rossi’s photographs that have never been exhibited before. This personal archive of visual culture has informed her work for 40 years and also captures an important bygone era in Chicago’s visual urban landscape. Rossi earned her MFA from the School of the Art Institute, where she has taught drawing and painting since 1971. The images from 1971 to 1975 included in the exhibition are from Rossi’s vast collection of 35mm slides and align with the dates of the paintings in “Poor Traits.” Arranged by the artist in a specific sequence to correlate one image to the next, they document hand-painted outdoor signs and window displays in Chicago and cities around the world. A limited edition artist’s book of these images will be published by DePaul Art Museum. The DePaul Art Museum is located just east of the CTA’s Fullerton ‘L’ stop. The museum hours are Wednesdays and Thursdays from 11 a.m. to 7 p.m., Fridays from 11 a.m. to 5 p.m., and Saturdays and Sundays from noon to 5 p.m. The museum is closed Mondays and Tuesdays. For more on the DePaul Art Museum’s upcoming exhibitions and events, call 773-325-7506 or visit http://museums.depaul.edu/. Chicago artist Tony Fitzpatrick will bring his signature brand of witty visual repartee to the DePaul Art Museum this spring with a display of his collage series ‘The Secret Birds.’ The exhibition will run through August 21, and is the largest presentation of his work to date with more than 50 of his intricately layered collages as well as 40 prints from the DePaul Art Museum collection that span more than two decades of the artist’s career. In his ongoing series ‘The Secret Birds,’ Fitzpatrick meticulously draws and layers images, poetry and found materials onto the page. He combines inspiration from his working class roots in Chicago and influences from folk art, comic book characters and tattoo imagery. Each drawn collage depicts a specific species of bird, ranging from the peregrine falcon to the common starling. Several of the works are commentaries on gun violence, drug abuse and other inequities and injustices found in Chicago and beyond. The event is free and open to the public. The DePaul Art Museum is located at 935 W. Fullerton, just east of the CTA’s Fullerton ‘L’ stop. The museum hours are Wednesdays and Thursdays from 11 a.m. to 7 p.m., Fridays from 11 a.m. to 5 p.m., and Saturdays and Sundays from noon to 5 p.m. The museum is closed Mondays and Tuesdays. For more on the DePaul Art Museum’s upcoming exhibitions and events, call 773-325-7506 or visit http://museums.depaul.edu/. The Drama Group is thrilled to present the emotionally charged musical, ‘Dogfight’ directed by Curt and Tammy Lang. It’s November 21, 1963. On the eve of their deployment to a small but growing conflict in Southeast Asia, three young Marines set out for one final boys’ night of debauchery, partying and maybe a little trouble. But, when Corporal Eddie Birdlace meets Rose, an awkward and idealistic waitress whom he enlists to win a cruel bet with his fellow recruits, she rewrites the rules of the game and teaches him the power of love and compassion. Performances will be held at the Drama Group Studio Theatre on August 5, 6, 11, 12 & 13 at 7:30 p.m. and matinees on August 7, 13 & 14 at 2:00 p.m. Tickets are $21 for adults; $20 for seniors and $15 for students with ID. Group discount rates are also available. Good seats are still available. Tickets can be purchased by calling the Box Office at 708-755-3444 or online http://www.brownpapertickets.com/profile/242073. For directions and other information regarding Drama Group activities, please visit our Web site at www.dramagroup.org. IPO @ Ravisloe returns for another series of 7p.m. concerts set against Ravisloe Country Club’s gorgeous Gilded Age architecture. Ravisloe Country Club is located at 18231 South Park Avenue in Homewood. Tickets are: $30 single tickets in advance; $35 single tickets at the door and $10 student tickets (with ID). Group Tickets are available for $20 each with a minimum of 7. Please call the office to arrange your group purchase, 708-481-7774.Tickets can be purchased online at www.ipomusic.org. For additional information, call 708-481-7774. Ravisloe’s Bunker Bar and Grill will offer a themed buffet and bar drinks before each concert. Reservations are suggested, 708-798-5600. Other dining options include: Fresh Starts, 1040 Sterling Avenue, Flossmoor, 708-957-7900 and La Voute Bistro in La Banque Hotel, 2034 Ridge Road, Homewood, 708-798-6000. Folksongs and Fairy Tales – Wednesday, August 10 at 7 p.m. Prepare for an enchanted evening as the IPO’s Woodwind Quintet evokes memories of a storied childhood. The program includes Peter and the Wolf, Ewazen’s Roaring Fork for Wind Quintet, Hungarian Dances by Farkas and other spirited works. Monday, August 1 at 6 p.m. – Summer Reading Finale — Join us for a StarChasers (Star Wars) show with the Great Boodini! Stick around after the show for a selfie with Darth Raul or Obi-Wan. Tuesday, August 2 at 11 a.m. – Drop Everything and Color — Today is National Coloring Book Day! Open to all ages, come unwind and color to heart’s content. Tuesday, August 2 at 2 p.m. – Art Studio — It’s time to create! Materials will be provided. Ages 12 and under. Tuesday, August 2 at 4 p.m. — Color-Rama! Coloring Circle — Are you a teen looking to take a break after school with a fun, fresh activity? Come relieve stress and show your creativity with other teens in our coloring circle! Tuesday, August 2 at 7 p.m. – PajamaRama — Share special moments with your child through stories, crafts, and more. Wear your pj’s and wind down from a busy day. Ages 12 and under. Wednesday, August 3 at 2 p.m. – Art Extreme! — We’re taking art to the EXTREME! Explore a wide range of art through painting, drawing, building and more! Art has never been this fun. You don’t want to miss out. Ages 12 and under. Wednesday, August 3 at 4 p.m. — Color Me Happy Circle — Our coloring circle is the perfect way to step back from the stress of everyday life and enjoy some relaxation! All supplies will be provided. Thursday, August 4 at 11 a.m. – Creative Play with Art — Bring your imagination and creativity to bring out your inner Picasso. Some projects may involve paint. Ages 12 and under. Thursday, August 4 at 2 p.m. – Comic Creations — Be inspired to become a graphic novelist/comic creator! Each week explore ways to create comic strips, books, graphic and more. Open to ages 7-12yrs old. Friday, August 5 at 10 a.m. — Color Me Calm: Adult Coloring Circle — Drop in and enjoy the hottest coloring trend. All materials are provided. Friday, August 5 at 10:30 a.m. – Butterfly Club — The Butterfly Club will track Monarch Butterflies in our backyard! We will collect and raise caterpillars, so we may release butterflies in the library gardens! Registration is Required. Children under 6 must have a chaperone. Shoes, socks, water bottle, and sunscreen are recommended. Friday, August 5 at 11 a.m. — “DIY” Tie Dye Friday! — Join us for one of the most POPULAR summer crafts! “TIE DYE”! Design your own T-Shirt, Scarf or Journal. You can bring your own t-shirt. Materials Provided. While supplies last. Ages: 12 and Under. The August Monthly Trip will be to the Isle of Capri on August 21 through 23. We will leave at 1 p.m. from the Rich Township Senor Center on Sunday, August 21 and return at approximately 6:30 p.m. on Tuesday, August 23. The price for a single room is $210, a double is $145 and a triple is $135. The trip includes $15 Isle Play on Sunday and Monday, 2 breakfast buffets at the Isle and $5 free play and 1 lunch buffet at the ‘new’ Rhythm City Casino on Tuesday, Reservations are now being taken by phone by calling 708-748-5454. Golfers of all skill levels are invited to show what they can do on the links at Roosevelt University’s 23rd Annual Scholarship Golf Outing being held August 1 at the Schaumburg Golf Club & Academy, 401 N. Roselle Road in Schaumburg. The outing begins with registration and buffet lunch at 11 a.m., followed by a shotgun start at 12:30 p.m. Cocktails, a delicious dinner and awards are at 5:45 p.m. There are a number of sponsorship opportunities still available, including event sponsor, hole sponsors, prize sponsors as well as foursomes and program book ads. For information about becoming a sponsor, contact Sara Lee Powell at 312-341-2309 or [email protected]. For golf outing information, contact Juliana Nelligan at 312-341-2252 or [email protected]. To register for the Roosevelt Scholarship Golf Outing, please visit www.roosevelt.edu/golf. The Music Department of SSC is excited to announce that the SSC String Orchestra is expanding to a full symphonic orchestra, beginning in August, 2016. SSC Director of Instrumental Music, Rob Calhoon, has long felt the need for a community symphony in our area. Rehearsals are on Monday evenings from 6:00 p.m. to 8:50 p.m. beginning August 22 at South Suburban College. Any instrumentalists who would like more information about the South Suburban Community Symphony Orchestra, or who would like to schedule an audition should call Rob Calhoon at 708-596-2000, ext. 2299, or email him at [email protected]. A new UChicago exhibition showcases the work of three Chicago-based artists and their shared interest in the social and spatial conditions of their surroundings. ‘Resonant Objects,’ on view through August 28 at the Logan Center Gallery and the Arts Incubator, features the work of Greg Bray, Aquil Charlton and Nazafarin Lotfi, who participated in the University of Chicago’s Arts + Public Life and Center for the Study of Race, Politics & Culture Artists-in-Residence Program. The exhibit is free and open to the public. Over the course of ten months, Bray, Charlton and Lotfi worked in studios at the Arts Incubator, generating research, artworks and happenings that fostered interactive relationships with diverse publics and spaces on Chicago’s South Side. Working across painting and sculpture, Bray blends collage and assemblage with an exploration of random structures. For ‘Resonant Objects,’ Bray presents abstract sculptures informed by his research into the earthquake, tsunami and nuclear purge that occurred in Eastern Japan in 2011. Fashioned from discarded chairs, Bray’s works are uncanny contortions of wood, plastic, metal and electrical cords. At once acquiring anthropomorphic guises and suggesting new forms, Bray’s sculptures speak to humanity’s resilience and capacity to create a new following moments of rupture. As the resident musician in this year’s cohort, Charlton’s work focuses on his music education, sound design and songwriting practices, as well as his research into the life and work of influential American singer/songwriter Eugene “Gene” McDaniels. McDaniel’s politically motivated recordings garnered success in the late 1960s and in recent times various hip hop producers including Prince Paul and Q-Tip of Native Tongues have sampled his work. Following this lineage, Charlton’s presentation infuses music creation with a deep social consciousness and pedagogical intent. Culling elements from McDaniel’s music and lyrics, as well as from his own repertoire, Charlton presents a series of sound installations that interpolate the unique acoustic and spatial qualities of the presenting galleries. Also on view is Charlton’s Mobile Music Box, an interactive vehicle that features instructions and recycled materials for making musical instruments. Lotfi’s sculpture- and performance-based practice explores the relationship between object, body and space. Lotfi engages in daily rituals of walking between her home and several spaces across Chicago’s Hyde Park and Washington Park neighborhoods, accompanied by large-scale, boulder-like sculptures crafted from papier-mâché. These mundane experiences—often reserved solely for the artist and without a prescribed audience—are recorded in physical impressions on the object’s delicate surfaces as they are rolled on the ground, as well as through the artist’s own body as she negotiates holding and carrying them aloft. For the exhibition, Lotfi presents a series of sculptures with distressed and painted surfaces alongside video and photographs documenting her actions in the public sphere. For additional information, call 773-702-8360 or visit www.uchicago.edu. More than 1,350 physicists from 49 countries will converge in Chicago for the biennial International Conference on High Energy Physics in early August to share new research results, announce new projects and talk about the most intriguing mysteries of the universe. The conference will be held Aug. 3-10 at the Sheraton Grand Hotel, 301 E. North Water St. Physicists from the large experiments at CERN’s Large Hadron Collider—the world’s most powerful particle accelerator—will present a wealth of new results. This will include an eagerly awaited update about a mysterious bump in the data that could be evidence for a new particle or just a statistical fluctuation, as more data are being analyzed. That will be merely one highlight in a program that covers 16 topics—from the Higgs boson to neutrinos to dark matter to cosmology, and will include new results from many experiments at institutions around the world. The conference includes two free events specially designed for the public: The Windy City Physics Slam and a public lecture on the recent, headline-making detection of gravitational waves. The Windy City Physics Slam, hosted by WGN-TV Chief Meteorologist Tom Skilling, will take place at 3 p.m. August 7 at the Sheraton Grand Hotel Chicago Ballroom. Inspired by poetry slams, the Physics Slam will pit researchers against each other in a contest to make their field of study sound as interesting, compelling and enjoyable as possible. Five scientists from around the world will compete, using music, dance, props and anything else they want, with the winner determined by audience applause. The public lecture, titled “The Detection of Gravitational Waves from Binary Black Hole Mergers,” will begin at 6:30 p.m. August 9, at the Sheraton Grand Hotel Chicago Ballroom. The speaker will be Barry Barish, the Linde Professor of Physics Emeritus at the California Institute of Technology. Barish has played multiple key roles for the Laser Interferometer Gravitational-wave Observatory since 1994. LIGO made international headlines twice this year with its discoveries of gravitational waves, whose existence were predicted by Albert Einstein in his 1915 general theory of relativity. Those events are free and open to the public, with seating on a first-come basis. • Once approved, you can register online using your family username and password. • If you do not have this letter you will need to provide 2 (two) proofs of residency at time of registration. (Address must match address in Skyward system). • If you complete registration by August 9th 2016, you will receive a $10 discount. Fees may be paid with cash, money order/cashier’s check, credit/debit, (Visa, Master Card, and Discover). Registration for fall 2016 is open at PSC. Credit courses begin Monday, August 22. Non-credit courses include a variety of single-day and multiple-session offerings that begin throughout the fall. PSC offers convenient, flexible scheduling options. Students can choose their schedule, their class and their time. Hundreds of courses are offered days, evenings, weekends and online to accommodate busy schedules. The 16-week courses begin Monday, Aug. 22. On Tuesday, Sept. 6, 14-week courses begin. The 12-week courses begin Friday, Sept. 16. All of these courses — 16-week, 14-week, and 12-week – end on Thursday, Dec. 8, and offer the same course material with the same credit hours. The shorter the number of weeks, the longer the class period. PSC also offers two different eight-week course sessions. First eight-week courses start Monday, Aug. 22, and end Friday, Oct. 14. Second eight-week courses start Monday, Oct. 17, and end on Thursday, Dec. 8. The eight-week courses typically offer fewer credit hours. Many of the college certificate programs offer eight-week courses, allowing students to fit two courses in a semester and to make progress towards that certificate. Both credit and non-credit courses are listed in the fall class schedule, available on the PSC main campus, located at 202 S. Halsted St., Chicago Heights. The schedule also is available at area public libraries and online at prairiestate.edu. To register for credit courses, new students must complete an enrollment application in person at the college or online. Current students can register for credit courses in person or online at prairiestate.edu/start. Through Friday, Aug. 12, Enrollment Services is open Monday through Thursday, 7:30 a.m. to 7 p.m., and the college is closed on Fridays. Beginning Monday, Aug. 15, Enrollment Services will resume regular business hours of 8 a.m. to 7 p.m., Monday through Thursday, and 8 a.m. to 4:30 p.m. on Friday. The college also will be closed on Monday, May 30, in observance of the Memorial Day holiday. Students can register for non-credit courses online or in person. To register online via Instant Enrollment, go to prairiestate.edu and select “How to Register for Non-Credit Courses” from the A-Z Index. Another option is to complete the registration form available online at prairiestate.edu/noncredit or in the back of the printed course schedule. Students also can register for non-credit courses in person at the Matteson Area Center (MAC), located at 4821 Southwick Drive in Matteson, or in the Enrollment Services Office on the PSC main campus. Through Friday Aug. 12, the MAC is open from 7:30 a.m. to 9:30 p.m., Monday through Thursday. Beginning Monday, Aug. 15, the MAC will resume regular business hours of 8 a.m. to 10 p.m., Monday through Thursday, and 8 a.m. to 4:30 p.m. on Friday. For more information about registering for courses, visit prairiestate.edu or call 708-709-3500. 3rd Prize: $100 Visa Gift Card. SSC is now offering a Free Class to first time credit students who reside within South Suburban College District 510, qualify for our Lake County, IN or Chicago regional rates or work for an employer within South Suburban College District 510. The Free Class applies to tuition only, and does not apply to courses of more than 5 credit hours. Individuals must not be receiving any state or federal financial aid or employer subsidies. More information is available at www.ssc.edu/freeclass. Students who wish to use financial aid as payment for fall classes must have an official high school or GED transcript on file. Official transcripts must have a school seal and graduation date on them. Transcripts can be hand-delivered to the Admissions Office or mailed to: Office of Admissions (15800 South State Street, South Holland, IL 60473). If a transcript is hand-delivered it must be in the original sealed, unopened envelope. Prospective students should complete the Online Application Form at www.ssc.edu to begin the enrollment process. New students will receive an SSC email account and a “My SSC” Username & Password via email which will allow access to the online schedule and class registration. The My SSC Portal also allows students 24-hour access during college closed periods. An SSC College-Wide Open House will be held on Thursday, August 4th from 4:30 p.m. – 7:00 p.m. at the Main Campus. Contact the Office of Admissions at 708-210-5718 for enrollment information. SSC’s Main Campus is located at 15800 South State Street in South Holland. The Oak Forest Center is located at 16333 South Kilbourn Avenue in Oak Forest. Calling all kids ages 50 years and older. Join us for Nature Camp for Seniors: Insects Abound on Monday, August 8 from 9 a.m. to 1 p.m. Discover what makes an insect unique. Explore the differences between insects, spiders, and other fascinating arthropods. Search for insects in a meadow, learning their unique sounds and special relationships with plants. For part of the program we’ll explore Thorn Creek Woods trails. Lunch will be provided. Participants should be prepared to walk ½ mile outdoors on natural surface trails across uneven terrain. Program is open to those age 50 years and up. Fee is $5 per person and registration is required by Saturday, August 6. For additional information or to register, call 708-747-6360. The Medical Cannabis Association will host an educational event on Sunday, August 7 at 12 noon at UUCC. For additional information, call the church office at 708-481-5339. 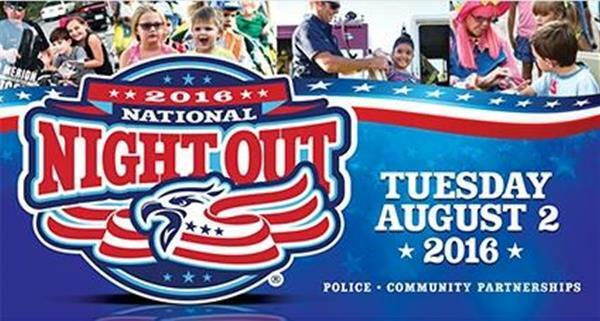 The Park Forest Police Department invites you to join them, on Tuesday, August 2 between 5 p.m. and 10 p.m., along with 37 million other citizens across the country, across 16,000 communities, in celebrating National Night Out Against Crime. Organize a gathering on your block and join the community in standing up against crime. Click to download the flyer. At the Park Forest Aqua Center, you feel the comfort and community of home and the fun, relaxation, and excitement of vacation all at the same time! Ask about how to become a member today! Learn more about the Park Forest Aqua Center! Since 1974, the Park Forest Farmers’ Market has been connecting area residents with local farmers, food vendors and businesses. The Market hosts 22 full spaces with a variety of fresh flowers, fresh fruits and vegetables, bakery goods, herbs and dairy products. Local businesses are also on hand at the Market selling artwork, garden ornaments, jewelry and more. The Park Forest Farmers’ Market accepts EBT/Link, WIC, and Senior Nutrition Coupons. The Market is open Saturdays, from 7 a.m. to 12 p.m. through October, for shopping, food, and entertainment. Learn more about the Park Forest Farmer’s Market at: http://www.villageofparkforest.com/Index.aspx?NID=98. The distant echo of gun fire has roared its thunderous blast in our community. The weeping of Rachel for her children is now our weeping. As an expression of solidarity and peace-seeking, the faith communities of Park Forest are gathering to pray for peace in our village, our nation and our world. The event will take place at St. Irenaeus Church on Wednesday, August 3, at 7 p.m. for a vigil, and as an ongoing commitment, the first Wednesday of each month to join our hearts, our hands, and our voices for peace. See you there!